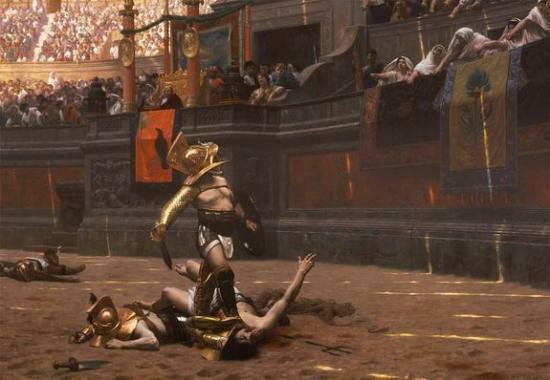 A reproduction of artwork by Jean-Léon Gérôme (1824–1904), shows the artist's conception of gladiatorial combat. One of the rules enforced in such combat may have killed the Roman gladiator Diodorus, researchers now find. CREDIT: Public Domain. An enigmatic message on a Roman gladiator's 1,800-year-old tombstone has finally been decoded, telling a treacherous tale. 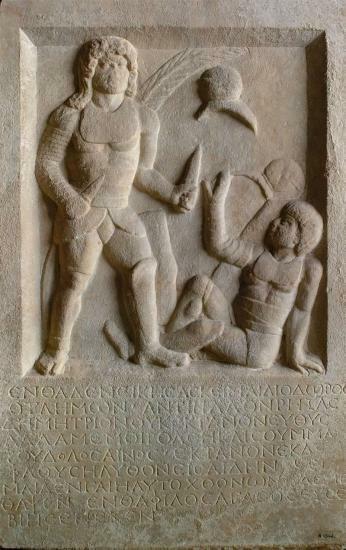 The epitaph and art on the tombstone suggest the gladiator, named Diodorus, lost the battle (and his life) due to a referee's error, according to Michael Carter, a professor at Brock University in St. Catharines, Canada. Carter studies gladiator contests and other spectacles in the eastern part of the Roman Empire. He examined the stone, which was discovered a century ago in Turkey, trying to determine what the drawing and inscription meant. This 1,800-year-old tombstone depicts a gladiator holding two swords standing above his defeated opponent who is signalling submission. The inscription below says Diodoros, a gladiator, was buried here. CREDIT: © Royal Museums of Art and History, Brussels. His results will be published in the most recently released issue of the Zeitschrift für Papyrologie und Epigraphik(Journal for Papyrology and Ancient Epigraphics). The tombstone was donated to the Musee du Cinquanternaire in Brussels, Belgium, shortly before World War I. It shows an image of a gladiator holding what appear to be two swords, standing above his opponent who is signalling his surrender. The inscription says that the stone marks the spot where a man named Diodorus is buried. "After breaking my opponent Demetrius I did not kill him immediately," reads the epitaph. "Fate and the cunning treachery of the summa rudis killed me." The summa rudis is a referee, who may have had past experience as a gladiator. The inscription also indicates Diodorus was born in and fought in Amisus, on the south coast of the Black Sea in Turkey. Though Carter has examined hundreds of gladiator tombstones, this "epitaph is completely different from anything else; it's telling a story," he told LiveScience. The story the tombstone tells took place about 1,800 years ago when the empire was at its height, its borders stretching from Hadrian's Wall in England to the Euphrates River in Syria. Gladiator games were popular spectacles, many of them pitting two men against each other. Although deaths from wounds were common, the battles were not the no-holds-barred fights to the death depicted by Hollywood, said Carter. "I believe that there are a number of very detailed rules involved in regulating gladiatorial combat," Carter said. Though the exact rules are not well understood, some information can be gleaned from references in surviving texts and art. For starters, most, if not all, of the fights were overseen by the summa rudis. Among the rules he enforced was one in which a defeated gladiator could request submission, and if submission was approved by the munerarius (the wealthy individual paying for the show), the contestant could leave the arena without further harm. Another rule that appears to have been in place was that a gladiator who fell by accident (without the help of his opponent) would be allowed to get back up, pick up his equipment and resume combat. It's this last rule that appears to have done in Diodorus. Carter interprets the picture of the gladiator holding two swords to be a moment in his final fight, when Demetrius had been knocked down and Diodorus had grabbed a hold of his sword. "Demetrius signals surrender, Diodorus doesn't kill him; he backs off expecting that he's going to win the fight," Carter said. The battle appears to be over. However the summa rudis — perhaps interpreting Demetrius' fall as accidental, or perhaps with some ulterior motive — thought otherwise, Carter said. "What the summa rudis has obviously done is stepped in, stopped the fight, allowed Demetrius to get back up again, take back his shield, take back his sword, and then resume the fight." This time Diodorus was in trouble, and either he died in the arena or Demetrius inflicted a wound that led to his death shortly thereafter. This event would have happened before a crowd of hundreds, if not thousands, of people in a theater or in part of an athletic stadium converted into a sort of mini- Colosseum. "Fate and the cunning treachery of the summa rudis killed me."